Before Walter Simonson's work with Marvel and DC, there was Star Slammers, a series first devised by Simonson during his college days. The Slammers would later be resurrected as a Marvel graphic novel, and then a miniseries. Simonson describes it thus: 'Once upon a time, there was a race of men who could out-shoot, out-fight, and out-kill anybody. They were paid fabulous sums to act as mercenaries. The practice became so lucrative, they decided to go into business. 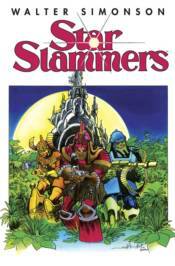 They became the most successful businessmen in history, and they called themselves�The Star Slammers!' The collected Star Slammers also features, published here for the very first time, Simonson's earliest version of the Slammers created for his college thesis at the Rhode Island School of Design. These stories predate his first professional comics work but strongly show the artist's keen sense of composition and design.